StoryCorps is kicking off its latest batch of animated shorts with work from two new artists. The oral-history project began partnering on videos with public TV’s documentary series POV in 2010. Previously, the animated shorts were created by Mike and Tim Rauch; this season, artists Julie Zammarchi and Gina Kamentsky take over. Jacobs said both animation styles have the same “handmade” look that StoryCorps was after. “The Rauch brothers had this wonderful, classic, 1960s Saturday-morning-cartoon feel, while this new style is like a graphic novel — more comic, less cartoon,” she said. StoryCorps is also ramping up station outreach efforts to help programmers use the shorts as interstitials. Marigold Media Group is consulting on that work, “and that’s been a game-changer for us,” Jacobs said, helping the radio project break into TV. Some 120 stations and the multicast World Channel air the animated shorts. The number of funders has grown as well. The animation initiative began with an initial CPB grant of $325,000 six years ago. Since then, the Kellogg Foundation, Ford, Carnegie and NEA have contributed support. The first video from Zammarchi and Kamentsky is “Traffic Stop.” Alex Landau, a young black man raised by adoptive white parents, recalls being pulled over by Denver police in 2009 and subsequently beaten by an officer. Landau and his mother talk about how the incident still affects him. The radio version of the story aired last August. StoryCorps initially planned to premiere the short on the one-year anniversary of Michael Brown’s shooting by police in Ferguson, Mo., Aug. 14. “We ended up releasing it before then because it’s so timely,” Jacobs said. 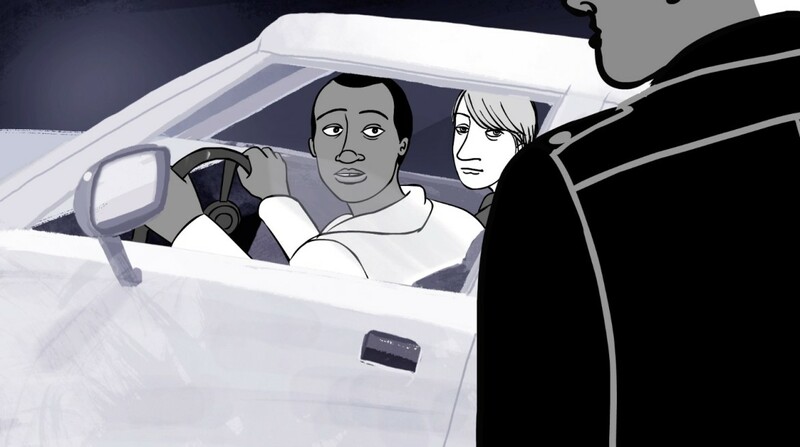 The next short is due Oct. 11, which the gay community celebrates as National Coming Out Day. “The Saint at Dry Creek” is based on a remembrance by Patrick Haggerty, lead singer and guitarist for Lavender Country. Its self-titled 1973 album is the first gay-themed album in country history. That story originally aired last June. The One Small Step project seeks to help people with opposing political views have civil, personal conversations.